I help B2B technology vendors increase end-user adoption of their platforms. Accelerating user adoption improves far more than stickiness. It cements relationships, builds advocates, increases quality product feedback, opens meaningful communication channels with clients & end-users, and streamlines follow-on sales opportunities. "It was a packed room, I thought it was a workshop but the more I look at it maybe it was a team meeting." What if you could have a "personal trainer" observe your team and recommend high impact tweaks to your "form" in real-time—based on how your unique team operates and the specific challenges it faces? My bespoke & highly interactive 1 or 2 day sessions create this structured & highly effective opportunity. 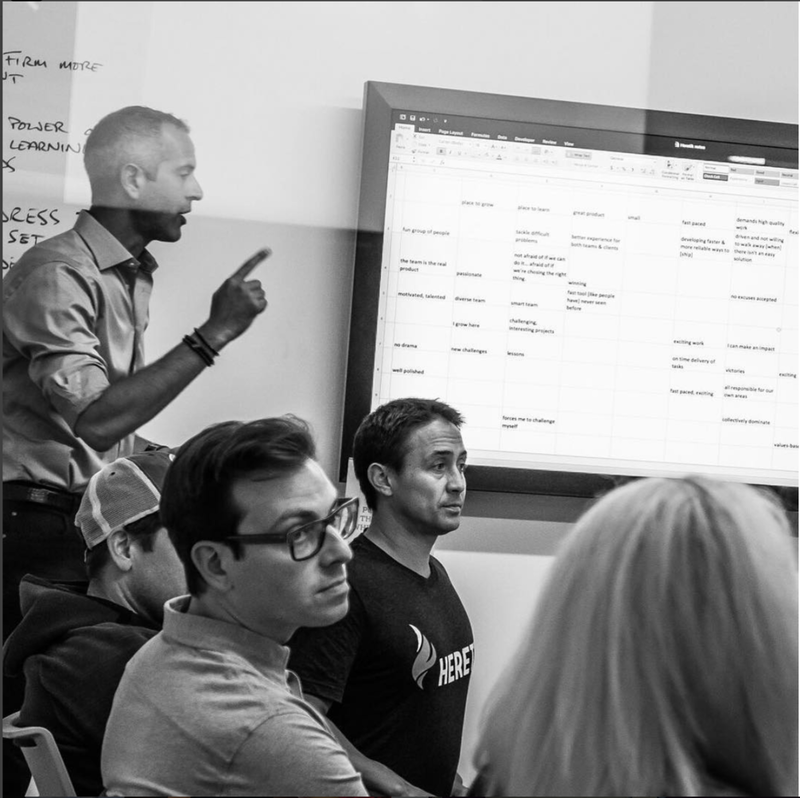 Coupled with just the right amount of team building, sessions accelerate learning, provide immediate, relevant feedback, and can even uncover cultural or structural challenges that may be blocking your team's progress. "Terrific message & insightful encouragement on people & culture. Good take-aways from/for my team, too." Modern technology is both powerful and dangerous. Voices are either amplified or drowned out, seemingly without regard to quality, usefulness, or relevance. So what gives? And what does this mean for an organization racing to keep current? With a combination of data, anecdotes, and a relaxed, approachable style, I help audiences make sense of the big changes happening around them and give them the confidence they need to meet uncertainty with action. Not everything fits neatly into a box. Consulting, advisory work, podcasting, panel facilitations, and executive retreat facilitation are amongst these things. I work with people I love, at companies I love. I stick to areas I know well. The goal is measurable impact that is self-sustaining. This work has evolved over the years and is the source of my expertise. What began as digital communications moved into interpersonal communications &, when social media came about, into tech-amplified interpersonal communications. The work I do now builds on all of that. My engagements have delivered value to industry leaders from a wide range of industries, including technology, foodservice, financial services & financial technology, retail, logistics, and professional services. Short- and long-term financial benefits include accelerated user adoption, reduced churn, increased renewals, and more targeted product development cycles. As the 1st LinkedIn-certified trainer in North America, I developed an approach to driving user adoption that outperformed LinkedIn's own methods by 250% - 900% on a per-client basis. Those techniques I pioneered are still used today by some of the world's largest brands—including LinkedIn. And with Brand Amper, the technology company I cofounded, I demonstrated that these methods worked beyond LinkedIn. My consulting work is focused mostly on vendors. I work primarily through the services and/or product teams. Since 2000, I have worked with entrepreneurs and corporate leaders to both lead and absorb the change brought on by new, more social technologies. The results include greater returns from technology investments as well as improved employee experiences. For technology buyers, the benefit to a successful digital transformation can be—in a word—transformational. I recommend workshops & speaking engagements for my buy-side clients. Consulting candidates will have an executive (likely a CIO) explicitly tasked with rationalizing their software stack who also has cross-functional support from Internal Communications, HR, and line management. It all started in 2009... or was it 1994? In 2009, I started partnering with LinkedIn, and soon became the first LinkedIn-certified training provider in North America. I regularly outperformed LinkedIn's own trainers in driving adoption of the platform by 2.5x or more, and was invited to make my process a regular part of LinkedIn's marquee user conference, TalentConnect, where it is still in use today. This work led to cofounding Brand Amper, a storytelling platform that simplifies the process of writing a professional "elevator pitch." Companies give Brand Amper to employees, and then can see trends across departments and geographies that help them amplify their brands to candidates in those areas. (Get it?) Brand Amper was purchased by The Muse (the leading career destination for Millennials) in 2017. But the foundation for this success was set through dual experiences I had had during the 16 years prior, first with high tech communications, and then with high touch communications. During my senior year at Wharton, I took an order—for a textbook, of course—using brand new technology: a website and email. For the next 7 years, I continued to build and optimize websites, an entrepreneur, as the Executive Producer of RollingStone.com—where I was responsible for the user experiences of 20-25 million monthly visitors—as a consultant, and as an industry blogger. This is where I learned about the inherent power of technology. But back in that same year in school, I also discovered organizational behavior, a discipline I'd turn to fully in 2002 when I'd start providing leadership & communications consulting to F500 executives & entrepreneurs—learning it well enough to teach at the graduate level. This is where I learned the limitations of technology, and the power of interpersonal engagement, and of giving people a reason "why" to stay engaged once technology's novelty had worn off. Today, the digital transformation work I do for HR represents a culmination of these experiences. For more information, please visit LinkedIn: in/seiden. For a glimpse into the future, visit my blog.